It is interesting to note the changing fashions of the sheet music covers throughout the 19th Century. 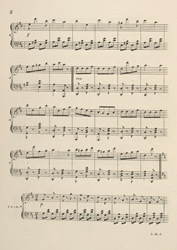 Initially small vignettes appeared at the top of the page with information about the performer and composer appearing below. The middle of the period saw the illustration take precedence, taking up most of the page. Later in the period when printing techniques had developed, new fonts had been introduced. Pictures disappeared completely from the covers and instead titles were presented in elaborate lettering styles.